Ergosign joined the Lufthansa Technik AG team to work on UX strategy and UX design and actively supported the workflow towards lean UX. The aim behind the AVIATAR platform is to make data for fleet optimization and predictive maintenance scenarios as usable as possible. Not just for their own fleet, but also as a service for all airlines worldwide. AVIATAR can be configured to suit the individual customer and can be made up of apps to suit the fleet and its needs. Further development will take place with Ergosign. "With AVIATAR, we wanted to go one step further and opted for radical user orientation. Together with Ergosign, we successfully introduced the collaborative UX process." AVIATAR is a very complex application that requires intense collaboration with aviation specialists. Ergosign had to integrate into the on-site team 100%. Establishing the new procedure with collaborative design and lean UX forms the foundations for efficiently implementing the AVIATAR vision. The management set the vision for the project – the autonomous teams were largely responsible for the implementation.s The new approach was established together with Ergosign. It is now enthusiastically put into practice on a daily basis, and the team has really internalized it. The initial ideas are generated using various creative methods and then realized in sprints in the form of prototypes and MVPs (minimum viable product). The MVPs were tested and validated with customers and external colleagues. Implementation took part in cross-functional feature teams. Each closed team was fully able to act independently and made up of Product Owners, Developers and Designers. The procedure and even the aims were defined independently by each team. Lufthansa Technik’s willingness to adapt to these new approaches was intrinsic to the success of the project. Lufthansa Technik and Ergosign have been successfully working together for 10 years. The involvement of Ergosign at the beginning of the project meant immense benefits for overall user experience. Close collaboration on site with the various perspectives and skills of different team members is vital at all times. Direct user feedback during the design process provided valuable input for ongoing development. Based in Hamburg, Lufthansa Technik AG operates 50 sites worldwide and provides maintenance, repair and overhaul (MRO) services for aircraft. It is a subsidiary wholly owned by the parent company Deutsche Lufthansa AG. 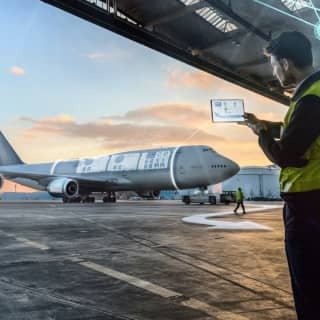 AVIATAR is not just a use case for internal application within the Lufthansa Group, rather has been designed as an open platform available as a product to the whole aviation industry. AVIATAR - Join the future.